A file with the M3U8 file extension is a UTF-8 Encoded Audio Playlist file. They are plain text files that can be used by both audio and video players to describe where media files are located. For example, one M3U8 file may give you references to online files for an internet radio station. Another might be created on your computer to build a playlist for your own personal music or a series of videos. An M3U8 file can use absolute paths, relative paths, and URLs to refer to specific media files and/or entire folders of media files. Other text information in an M3U8 file may be comments that describe the contents. A similar format, M3U, can use UTF-8 character encoding, too, but may include other character encodings as well. Therefore, the .M3U8 file extension is used to show that the file is in fact using UTF-8 character encoding. M3U8 files can be edited and read by most text editors, including Notepad in Windows. See this list of the Best Free Text Editors for some other options. However, as you can see below, opening this M3U8 file in Notepad only lets you read the file references. You can't actually play any of these music files like this because text editors are not the same as media player or media management software programs. An M3U8 File in Notepad. 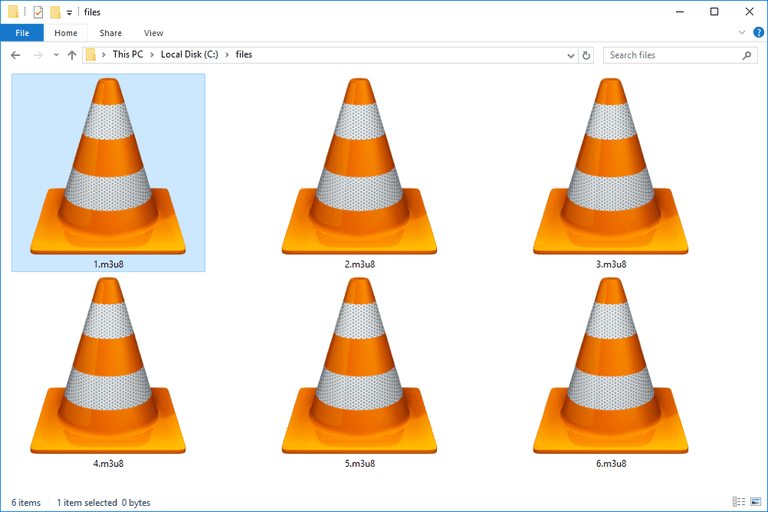 VLC, Apple's iTunes, Windows Media Player, Songbird, and M3U Player are just a few examples of programs that can open and use M3U8 files. Another way to open M3U8 files on Linux is with XMMS, while Mac users should be able to play M3U8 files with CocoModX (in addition to some of the Windows-compatible programs mentioned above). Here's an example of the same M3U8 file from above but open in VLC, which will gather all the music files referenced in the text file and load them into the media player for playback. An M3U8 File in VLC. One quick way you can open an M3U8 file online is through HSLPlayer.net. However, this website will not work if you have an M3U8 file stored on your computer or some other device. You can only use HSLPlayer.net if you have a URL to the .M3U8 file and the files it references are also online. Another way to play M3U8 links you find online is with the Chrome extension Play HLS M3u8. Some of these programs also let you create an M3U8 file. For example, if you load a bunch of files into VLC, you can use the Media > Save Playlist to File... option to create an M3U8 file. If you're looking to convert M3U8 to MP4, or to MP3, or to any other media format, you first need to understand that an M3U8 file is a plain text file — nothing more and nothing less. This means it just contains text, nothing that can actually "play" like how an MP4 or MP3 file can play in a media player. What you're probably after is a file converter that can convert the audio or video files that the M3U8 refers to, to and from other audio/video file formats, like an MP4 to AVI converter or a WAV to MP3 converter (or any other variation of these types of files). For that, see our list of Free File Converter Software and Online Services. The only problem with doing this is that sometimes an M3U8 file points to media files that are in several different locations at once. This may include various folders on one or more internal hard drives, flash drives, and/or an external drives. If this is the case, we don't recommend manually searching through all of them to find your files. Instead, just use the free program M3UExportTool. It uses the M3U8 or M3U file to identify where all the media files are located and then copies them to a single location. From there, you can easily convert them with a video or audio converter. M3U8X is a similar program that should work much like M3UExportTool. You'll need a RAR opener to use this software, which you can find here. We don't have any download links to dedicated playlist converters that do conversions like M3U8 to M3U, but some M3U8 openers like VLC can re-save an open M3U8 playlist to another format like M3U, XSPF, or HTML, which is essentially the same thing as a conversion. If you can't open the M3U8 file using the methods above, there's a good chance that your file isn't actually in this playlist file format. Some file types use a file extension that looks a lot like it reads .M3U8, so you'd be wise to double-check the file extension. One example of a file extension that looks a lot like M3U8 and M3U is MU3, but that file is actually in the Myriad Packed Musical Score file format. You need Myriad's Harmony Assistant or Melody Assistant program to open it.